Because many students are familiar with contouring methods, they can mechanically construct water table maps from canned data sets with ease. However, their contouring abilities may mask their level of understanding. This field exercise aims to instill a deeper understanding of the nature of a water table surface as students also learn fundamental hydrogeological field techniques. The exercise is based at Newark Road Prairie, which is owned and managed by Beloit College and located approximately five miles from campus. The property contains native prairie, wetlands, and a small stream. Although many schools may not own similar types of properties, land managers are often willing to allow the installation of shallow wells on public lands (e.g., county parks, state wildlife areas). Seven shallow monitoring wells and four staff gages are currently installed at Newark Road Prairie. When we arrive at the field site, we begin by making observations on the subtle changes in topography and the direction of stream flow. Although we have just carried in all of the field equipment, I ask what type of information we will need to create a water table map. Handouts for the exercise are distributed after this discussion (see Supplementary Materials below). Students are divided into groups of three for the field portion of the exercise, although each student ultimately drafts their own map using group and class data. Each group gets an electronic water level meter, a GPS unit, and a measuring tape, and we discuss the magnitude of error incorporated into the measurements taken by each of the instruments. We then review basic operation procedures for the water level meters and the GPS units, and students confirm that their GPS units are using the correct coordinate system and datum (UTM, NAD83). We discuss surveying techniques as a class, and supplemental instructions are also provided in the handout (see Supplementary Materials below). We establish a centrally-located, bench mark (usually one of the staff gages) from which the students survey the wells and other staff gages. Each group is responsible for surveying at least two wells or staff gages. Groups distribute their surveying results to the rest of the class when we return to campus. Each group checks their results in the field, which reduces the chance of propagating surveying errors throughout the class. Groups need to take water level measurements, survey wells, and record GPS coordinates for each well and staff gage. Additionally, because Newark Road Prairie has an established grid system with posts and markers at ten meter intervals, students measure the distance of each well/staff gage from at least three markers in order to evaluate the accuracy of their GPS measurements. Groups rotate the surveying equipment and are responsible for collecting all of the necessary data within the two lab periods. Two three-hour lab periods provide ample time for each group to collect the necessary data sets, including the time required to load/unload equipment and drive to/from the site. 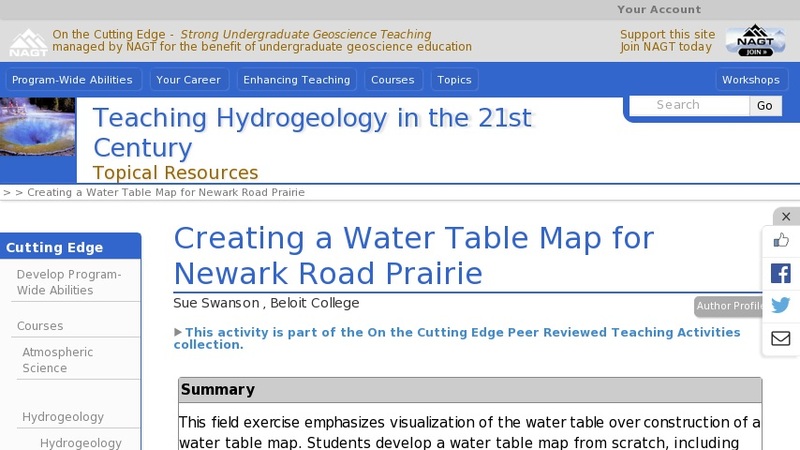 One 50-minute class period is provided for distributing survey results, compiling and printing base maps using ArcGIS, and contouring the water table maps.